The Pakistan Automotive Manufacturers Association announced on Monday that Pakistan's locally assembled cars and Light Commercial Vehicles (LCVs) sales volume jumped by 23 percent to 23,562 units in January on the yearly comparison and by 22 percent on the monthly comparison. The growth was largely attributed to Pak-Suzuki Motor Company's (PSMC) impressive sales numbers of the Wagon-R (an increase of 1,101 units) and Cultus (an increase of 680 units) and a strong response to Honda Atlas Cars' BR-V (an increase of 500 units). Moreover, recent changes in import procedures have also resulted in a higher offtake for the less than 1,000cc segment, as consumers continue to shift to Pak-Suzuki Motor Company. According to the Pakistani auto industry's official numbers, volumes for PSMC and Honda Atlas Car (HCAR) increased by 24 percent and 10 percent on yearly comparison while Indus Motor's volumes decreased by 7 percent. Furthermore, growth was also recorded in LCVs sales, as they increased by 38 percent to 3,638 units in January this year when compared with the sales of 2,629 units in January last year. Similarly, tractor sales continued to perform well, thereby registering 5,863 units for January, up by 9 percent as against 5,390 units in the same month of last year. Moreover, motorcycles and three-wheelers also witnessed a fair bit of increase of 20 percent on the yearly comparison and 13 percent on the monthly comparison. Imports of used cars and minivans surged to 65,723 units in 2017, up almost 70 per cent from 38,676 units a year ago, latest data released by the auto industry shows. The arrival of sport utility vehicles (SUVs) also increased 59pc to 7,758 units. Imports of pickups and vans registered a 9pc rise to 3,154 units. The local industry maintains a record of each imported vehicle, whether new or old, through the Import General Manifest (IGM). Every imported car is logged in the customs’ IGM. Toyota Vitz remained the most popular imported car in 2017. As many as 8,680 units arrived in 2017, up almost 40pc from a year ago. The volume of Daihatsu Mira swelled 73.1pc to 6,091 units. KARACHI: Pakistan expects the demand for skilled manpower to grow exponentially as the multibillion-dollar China-Pakistan Economic Corridor (CPEC) project expands. “The total cost of CPEC projects has already gone from $46 billion to $62 billion and it is hoped that the total cost will rise to $100 billion by 2030,” Executive Director of the Planning Commission’s Center of Excellence (COE) for CPEC Dr. Shahid Rashid said in a press briefing on Thursday. Many Pakistani institutes are now offering a range of courses — including Chinese-language — to enable Pakistani youths to find employment, and China has vowed to help set up a world-class vocational training institute in Islamabad. More institutes are expected to open in Pakistan in the near future to cover the expected rise in job opportunities offered by CPEC. CPEC starts from Kashgar in Xinjiang, China, and reaches Karachi and Gwadar, on Pakistan’s south coast via the Khunjerab Pass. Chinese Ambassador to Pakistan Yao Jing reiterated during a meeting with Executive Director of National Vocational and Technical Training Commission Zulfiqar Ahmad Cheema that CPEC will provide job opportunities to thousands of trained Pakistanis. Jing vowed that China will soon initiate special programs for Pakistani trainers, which will enable them to teach hundreds of Pakistani workers every year how to use modern machinery and equipment. Majyed Aziz Balagamwala, president of the Employers’ Federation of Pakistan and a member of the Sindh Technical Education and Vocational Training Authority, told Arab News that a training program “initiated with leading institutes” would produce 200,000 skilled workers in the next three years. “We do not intend to just produce labor, our aim is to provide them with multiple skills so that they can get better jobs and play their role in the country’s economic uplift by contributing to CPEC,” he explained. Analyst and CPEC expert Maqbool Afridi stressed the need to expand the skills of Pakistani workers. Afridi said CPEC is a world-class project that demands technically skilled manpower not only to run the projects, but also to balance the share of jobs between the two countries. Despite substantial progress on CPEC, many are unhappy about how little information about the project has been shared with the public. Pakistan has already lost sovereignty over Gwadar. By an Agreement, Gwadar port has been leased to China for 40 years. Bhatia: "Pakistan has already lost sovereignty over Gwadar. By an Agreement, Gwadar port has been leased to China for 40 years. " Australia has signed a 99-year lease for Port Darwin for China. Has Australia lost sovereignty there? Ishrat Husain is a former dean and director of IBA and a former governor of the State Bank of Pakistan. The foremost singular contribution that has already made a significant and visible difference is the addition of 10,000MW to the generation capacity in Pakistan, in a span of four years. It has overcome chronic energy shortages, altered the fuel mix, and substituted plants with 61 per cent efficiency factor in place of those operating at 28 per cent, bringing down the cost to consumers. Electricity outages had cost the economy about 1.5 to 2 percentage points of the Gross Domestic Product (GDP). Export orders were cancelled and the buyers walked out of Pakistan as their traditional suppliers could not fulfil the orders on time, due to energy shortages. The value of exports took a dip, precipitating a balance of payments crisis. As new hydel, renewable, coal-based projects come on board, there will be a corresponding shrinking of imports of furnace oil and diesel. The associated risk of an additional supply of power is that unless we restructure or privatise the distribution companies, or make the power distribution sector competitive, the circular debt would keep on rising. Distribution losses and non-recovery of dues have put enormous pressure on public finances, and the subsidies on this account may escalate if institutional reforms are not undertaken. The second area that would benefit Pakistan is the construction of highways and the railway line linking Gwadar with Kashgar and the mass transit systems within big cities. The rehabilitation and upgrading of the main railway line with high speed trains, would relieve businesses of the high cost of domestic transportation of goods to and from Karachi (at present, the bulk of the freight is carried by a trucking fleet). The inner city mass transit systems in Lahore, Peshawar, Karachi and Quetta, would provide safe and affordable public transport to the citizens, who face inconvenience and spend a lot of time and money in commuting to work. The reduced travel time and saving in transportation expenses would increase their productivity and also augment the purchasing power of the lower income and the lower middle-income group. The western route would open up backward districts in Balochistan and southern Khyber-Pakhtunkhwa (KP) and integrate them with the national markets. The communities living along the route would be able to produce and sell the output from their mining, livestock and poultry, horticulture and fisheries, to a much larger segment of consumers. Their transportation costs would become considerably lower, the proportion of perishables and waste would go down, cool chains and warehousing would become available and processing would become possible in the adjoining industrial zones. Access to a large trucking fleet and containers, with greater frequency and reduced turnaround, time may help in the scaling-up of operations. The fibre optic network would allow the citizens of these deprived districts access to the latest 3G and 4G broadband Internet connections. The Woodrow Wilson International Center for Scholars is Washington's only independent, wide-ranging, non-partisan institute for advanced research where vital current issues and their historical and cultural background are explored through research and dialogue. Created by the Congress of the United States as the nation's official memorial to its twentieth-eighth president, the Center seeks to commemorate through its residential fellowship program both the scholarly depth and the public policy concerns of Woodrow Wilson. This competition is open to men and women who are from, and based in, Pakistan. Applications will be accepted from individuals in academia, business, journalism, government, law, and related professions. Candidates must be currently pursuing research on key public policy issues facing Pakistan, research designed to bridge the gap between the academic and the policymaking worlds. The Wilson Center customarily expects its visiting scholars to possess the terminal degree in their field. For academics, such as university professors, the terminal degree generally means a Ph.D. But other professions have different terminal degrees; for journalists or businesspeople, it could well be a B.A. In exceptional cases, the Wilson Center will waive the terminal degree requirement for highly qualified and unusually talented applicants. But under no circumstances will the Pakistan Scholar competition be open to anyone currently pursuing a graduate degree or working on a doctoral dissertation. In addition, applicants must have at least eight years of professional or research experience. Preference will be given to applicants who have published scholarly books or substantial articles in academic or policy-related journals or newspapers. Applicants must be completely fluent in both written and spoken English. Pakistan Scholars will be in residence at the Woodrow Wilson Center for the U.S. academic year, September 2014 - May 2015. While at the Wilson Center, Pakistan Scholars will be expected to carry out a full schedule of rigorous research and writing based on the topic outlined in the research proposal submitted at the time of application. They will also be expected to participate in workshops, seminars, and conferences organized by the Center's Asia Program, and in other ways to participate in the intellectual life of the Wilson Center and the larger community of South Asia observers in Washington. The stipend provided to Pakistan Scholars is $5,000 per month. In addition, the Wilson Center will also pay a portion of health insurance premiums for the scholar, and provide assistance for travel from Pakistan. The scholars will be provided with suitable work space, a Windows-based computer, and where feasible, a part-time research assistant. U.S. imperialism has played an unambiguously destructive role in Pakistan for most of the country’s seventy-year history. Aside from decisively empowering the military establishment, its support of religious militancy in the 1980s precipitated a complete transformation of the body politic. The secular political traditions of other societies in the region were similarly undermined by the rise of millenarianism, with Afghanistan worst affected. Today Washington seeks to maintain its waning influence in the region through a zero-sum strategic game that has seen India, Pakistan, Iran, and Afghanistan pitted against one another, forcing their own people to bear the cost. In this context, China’s claim to advance a development agenda that transcends the narrow geopolitical calculus that has long defined regional dynamics should be evaluated carefully. The biggest question mark in the OBOR strategy in South Asia remains Beijing’s frosty relations with New Delhi. Still, the volume of official trade between China and India totaled almost $71 billion in 2016—nearly six times that between China and Pakistan. Thus economic ties are expanding despite the Modi government’s nationalist posturing. In any case, China’s growing economic and political role in the region necessarily means that the era of Washington’s unrivalled hegemony, especially in its longtime frontline state of Pakistan, has ended. Even if one takes the rather blunt metric of CPEC financing, the rhetoric is far removed from reality. Of the $28 billion injected into Pakistan’s economy by late 2016 through CPEC’s “early harvest” projects, $19 billion was in the form of commercial loans. In the not-too-distant future, this portends yearly debt repayments of more than $3.5 billion.13 It is not at all clear, then, that China offers a financial alternative to the International Monetary Fund/World Bank juggernaut that has already saddled Pakistan with a foreign debt burden approaching $80 billion. Perhaps most importantly, China’s seemingly apolitical developmental intervention is consolidating the existing structure of power in Pakistan, and in particular the military establishment that Washington helped make into the country’s dominant force. Recent events suggest China is exerting some pressure on Pakistan’s GHQ to break with the religious militants long used as proxies against India and Afghanistan.14 This would make sense, given China’s commitment to expanding market exchange through its infrastructural and other investments, and the attendant fear that these investments may be threatened by militant movements in Pakistan. Even if peace were achieved overnight, however, the Chinese vision of “development” would not represent a genuine and sustainable alternative to neoliberal development practices as they have been institutionalized around the world. China’s intervention in Pakistan thus cannot be considered the progressive “other” to the destructive militarism—both state and non-state—that U.S. imperialism and domestic elites have imposed on Southwest Asia for decades. ISLAMABAD, June 8 (Xinhua) -- Five years after its launch, the China-Pakistan Economic Corridor (CPEC) has achieved magnificent results that help lay a solid infrastructure foundation for Pakistan's economic development. Under the long-term and systematic framework of CPEC, several projects in areas of energy, transportation infrastructure and port construction have been completed. Pakistan's Ministry of Energy said that the completed CPEC power projects have brought a great change in the energy sector by bringing the power cut hours to zero form 12-14 hours a day in 70 percent of the country. Two coal-fired power projects equipped with the latest state-of-the-art environment-friendly technology -- the 1,320-megawatt Sahiwal coal-fired power project in the country's Punjab and the Port Qasim coal-fired power plant with the same capacity in southern port city Karachi -- have already started production. The two projects are expected to generate 18 billion KWh of electricity together annually, which can cater for the needs of eight million local families. The CPEC power projects not only have eased daily lives of Pakistanis but are also creating hundreds of thousands of jobs by helping restart the industries that were closed due to power shortage. Besides the coal-fired power plants, CPEC also provides new energy to Pakistan so as to diversify the country's energy sources to maintain its energy security. Part of the Quaid-e-Azam Solar Park is functional and three wind power farms are also supplying electricity in southern Sindh province, while two such projects will also start their commercial operations later this year. Pakistan's Ministry of Planning, Development and Reforms said that energy projects under CPEC will double the energy-thirsty country's current capacity of electricity production after their completion. Yasir Rehman, an anchor from the official Pakistan Television, said that the developed infrastructure under CPEC is bringing stimulus to the Pakistani economy, creating jobs and improving business by starting a constructive process. "Uninterrupted power supply is helping industries increase production, creating an ideal atmosphere for Pakistan's economy," said Rehman, adding that with the functionalized Gwadar port, CPEC will benefit every common Pakistani. Gwadar, the ending point of CPEC, which was once an ignored small sluggish fishing town located at the Arabian Sea in Pakistan's southwest Balochistan Province, is now witnessing a wave of development projects which are creating new opportunities for employment and business. Gwadar port, with the fully functional port terminal, regular cargo service, free zone, business center, is a symbol of future development and prosperity of Pakistan. According to China Overseas Ports Holding Company (COPHC), the port's operator, some 20 companies in different businesses have already joined the Gwadar free zone with direct investment of 3 billion Chinese yuan (over 460 million U.S. dollars). Gwadar's local people are feeling the development impetus triggered by the rapidly developing port, construction of new roads, establishment and upgrading of educational institutions and hospitals, construction of a new international airport and installation of water purification plants. Thousands of people, from laborers to businessmen, have migrated from across the country to Gwadar to grab emerging opportunities for business and employment since the launch of CPEC. In the meantime, CPEC has also brought major improvements and overhauls to Pakistan's transportation infrastructure by upgrading and reconstructing already existing roads and building new superhighways. Chinese Deputy Head of Mission Lijian Zhao Friday said that more than 70,000 Pakistanis are working on various development projects under China-Pakistan Economic Corridor (CPEC) while China has deposited $1 billion with the State Bank of Pakistan. "China has given a soft loan to Pakistan at around 2 percent interest rate for major infrastructure projects of $6 billion under the CPEC," he added. He said major transport projects included M-5 Motorway project (Multan-Sukkur), Orange Line Metro Train and KKH Phase II (Thakot-Havelian Section)." About energy projects, he said that China is helping Pakistan overcome energy crisis. He said that as many as six power plants including 2×660MW coal-fired power plants at Port Qasim Karachi, three wind power projects in Sindh, solar power project and Sahiwal coal-based power plants have been completed. He said that 10 power plants including coal and hydropower projects are under construction. He said that these power plants have a total generation capacity of 11,000MW of electricity. He said that five years earlier, there was seven to eight hours electricity load-shedding daily in Islamabad. But now there is zero load-shedding in Islamabad. He said that sometimes load-shedding in the federal capital occurs due to technical reasons and old transmission lines. He said that 14 projects are under construction, eight have been completed and 21 projects are in pipeline while their groundbreaking has been taken place. He said that there are 43 early harvest projects under the CPEC and most of them would be completed in 2019. He said that a few hydropower projects are long-term which would be completed in 2023. About Gwadar free zone, he said that more than 30 Pakistani companies have been registered for Gwadar Free Industrial Zone and more companies are in pipeline. He said that China has constructed 'Business Centre' within a record time of five-and-a-half-month in Gwadar. He said that China Overseas Port Holding Company has also installed desalination plants at Gwadar for supplying drinking water to the people in the port city. Answering a question, he said that Pakistan Peoples Party (PPP) government had handed over Gwadar to Chinese companies. He said that Gwadar Port is very significant for China, Pakistan and rest of the world. He said that China is also responsible for developing Gwadar free port. He said Part-I of free port was appearing on the ground. He said that as many as nine industrial parks would be established in Pakistan. He said that facilities of electricity, gas, internet and road, etc, would be provided to the industrial zones. The Chinese envoy said that Gwadar international airport would be built soon and its groundbreaking ceremony would be held after October 2018. The Chinese deputy head of mission said a hospital is also operating in Gwadar. He said that fisheries would be a great industry in Gwadar. He said 500 students are studying in a Gwadar school built by the Chinese companies. Answering a question about western route, he said that propaganda is done in this regard. He said that the western route is also in the interests of China and it would be completed. Furthermore, he said that China has made tremendous economic growth. He said that now China is working to enhance its gross domestic product (GDP) growth, adding in the next 10 years, GDP of China would be doubled. Zhao also said that China wants good relationship with every country, including the United States. Investment project with 14% is impossible. Sinosure's rates are set at maximum 7% for the total period of 15-20 years of the project. However it is paid only once, therefore it is 0.3-0.5% every year. If you add LIBOR+4.5%, it is only about 6%, not 14%. At budget seminar today it was authoritatively disclosed that loans for CPEC projects are at LIBOR+ 4.5%+Insurance guarantee 7.5% ie nearly 14% interest. Can any economy borrow at this rate? Watch out! Absence of transparency undermining CPEC. Clarification needed. 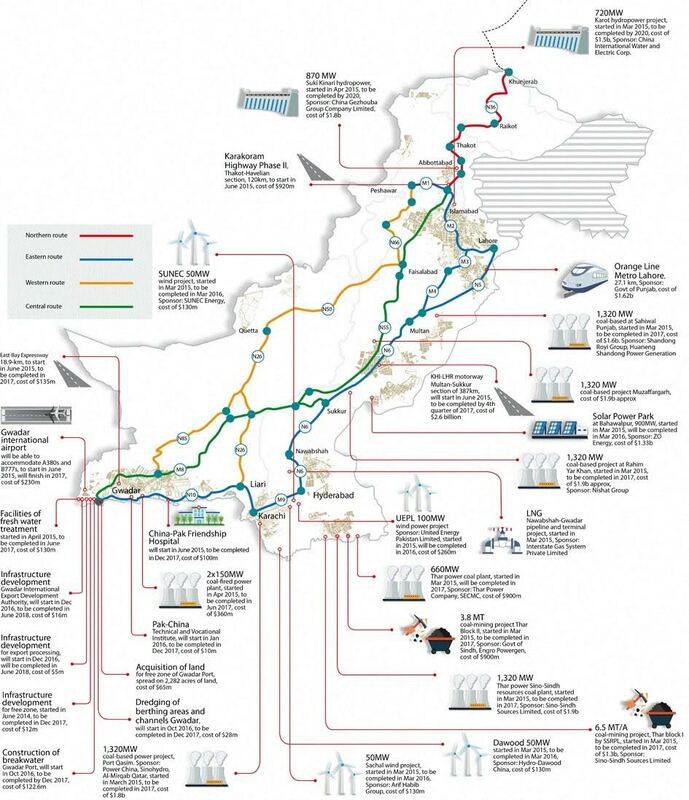 Research into the NEPRA archives has indicated that in July of 2015 [CPEC start, April 2015] there began a flood of petitions filed consecutively for inclusion of Sinosure fees into wind power project financing. For NEPRA, this amounts to an unmatched influx of pressure unseen anywhere else in their operating history, and presents compelling evidence both in frequency and qualitative content to move to withdraw support from the null hypothesis. The NEPRA petition database shows a large uptick in requests that the Government of Pakistan capitulate to Chinese requirements to utilize insurance through Sinosure. For Chinese projects abroad, project insurance flows through one provider. This firm is the China Export and Credit Insurance Corporation/中国出口信用保险公司, or Sinosure. This State Owned Enterprise is China’s main insurer of export financing and provides protection for SOE’s and other large firms against political, commercial and/or credit risks operating or exporting abroad. Critically, Sinosure coverage is mandatory insurance for Chinese overseas bank loan and equity investment. In other words, it is required for anyone outside China who wants access to this type of capital from Chinese actors. In late March, the government of Italy signed a memorandum of understanding to join China’s Belt and Road Initiative, Beijing’s $1 trillion plan to develop land and sea trade routes from Asia to Africa to Europe. Italy is the first large European economy to do this, agreeing in principle to deals with China worth about $2.8 billion in investment in a variety of sectors. This set off alarm bells in the White House and groans in the European Union. While the Trump administration fretted about yet another Chinese attempt to expand its sphere of influence, the EU stressed that Italy was undermining Europe’s ability to engage with China as a single bloc. Italy’s rationale for joining the Belt and Road Initiative is straightforward: An influx of Chinese investment could help push Italy out of its economic doldrums. Meanwhile, Italian exporters could gain access to China’s massive domestic market. That sounds attractive enough, but Italy would be wise to look to other countries that have signed up for the initiative and the challenges they’ve faced. Pakistan’s experience in particular is telling. At first blush, the two countries seem wildly different. Italy is a member of the G-7 and the world’s eighth largest economy. Pakistan, despite having more than triple the population, barely cracks the top 40. It has also been bailed out by the IMF nearly 15 times. On closer inspection, though, the two countries share important similarities. Both Pakistan and Italy are heavily burdened with debt: As of 2018, Pakistan’s debt was 73 percent of GDP, and Italy’s was an eye-popping 132 percent.Both Pakistan and Italy are heavily burdened with debt: As of 2018, Pakistan’s debt was 73 percent of GDP, and Italy’s was an eye-popping 132 percent. Each is reliant on external help: Pakistan has required a combination of IMF loans and the support of the Gulf states and China to keep it in the black. Similarly, since the 2008 financial crisis, Italy has relied on bailouts from the European Central Bank. To compound matters, Italy’s growth rate has been near zero. As a result, both states have been hungry for external capital, both are in search of new markets for their exports, and both need to claw their way out of debt. In Pakistan, former Prime Minister Nawaz Sharif decided that Belt and Road fit the bill, and he opened his country up to a wave of Chinese investments in 2015. The results have been mixed. China has indeed poured money into Pakistan, but it’s been in the form of loans to Pakistan that it must then give to Chinese firms to set up shop there. Those firms have invested in equipment bought in China—not Pakistan. With little capital going into Pakistan, the country’s debt burden has only shot up. Pakistan is now negotiating with the IMF for a new bailout, but the IMF’s concern about the lack of transparency of Pakistan’s debts to China has complicated matters. One can foresee similar tensions arising in Italy: a European Central Bank that is reluctant to come to the aid of an Italy that takes on greater debt in exchange for less transparency. The United States has advanced the argument that the IMF and its donor states shouldn’t subsidize Pakistan’s dealings with China. Italy could find itself in a similar position with the European Central Bank.